Following on from 2015's pretty good The Dead of the World, Germany's Ascension have mixed it up a little, reducing the orthodox black metal and increasing the death metal to make a mix that's more their own. The rumbling intensity of before plus a new technicality in the riffing makes for an intriguing mix, tracks like Ever Staring Eyes approaching Incantation territory at moments, particularly in the savage drumming. Ascension's central components are from solid to excellent, especially the guitars which beg to be allowed more time for those incredible melodic and atmospheric leads, and the vocalist is superbly intense, particularly on closing track Vela Dare. There's a nicely aggressive air generally, focused on Dreaming in Death, while even more melodic sections are well-placed and effective. 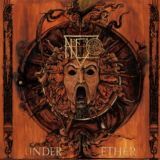 Where Under Ether is let down is in the generally samey-sounding songs, even down to the tempo in some cases; although the band throw in little touches to differentiate them if you listen closely, it's rare and certain songs are definitely too long. The repeated shouts of "this is our temple" in Ecclesia make it seem even longer than its five minute running time, for instance, while elsewhere Stars to Dust is a little too in love with that central grooving riff. This criticism is a shame, because there are moments of subtle genius here - the groovy, almost Gojira-esque opening riffs of Pulsating Nought, say, or the ambience worked into the backing of Thalassophobia. The shorter length of the album definitely works in its favour, too; an hour of material like this would drag, but just over forty minutes is perfectly judged. Although they've made more steps towards originality and still make a decent black metal album, Ascension are yet to truly bowl me over, and Under Ether is another good enough album from them when I feel they could do better. Not bad for fans of the style otherwise.